When you buy a beginner guitar it is also a good idea to invest in a guitar book as well. Having a reference book on hand is incredibly useful especially for someone who has never played guitar before and isn’t really sure where to start. 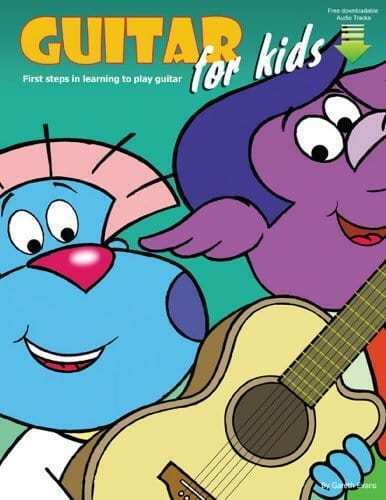 Or if you are teaching your kids how to play guitar yourself and need some guidance, there are lots of really good books that will teach your kids a lot about the guitar in a fun and stress-free way. Here are a few books that I have come across that I think are worth checking out. 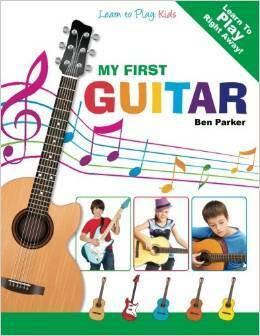 My First Guitar: Learn To Play: Kids by Ben Parker is a really good book if you are into self- directed learning for your kids. It has little mini lessons on very basic things that you need to know when you take up the guitar like how to hold the guitar and the pick, as well as lots of great info on how to tune the guitar. Once that is mastered then your kids can learn about chords and strumming and then onto learning basic common songs like Wheels on the Bus and Twinkle Twinkle Little Star. This a really good book to pick up as a companion book with a first guitar, it is well worth the price. Your kids will be playing chords all on their own very quickly with help from My First Guitar. 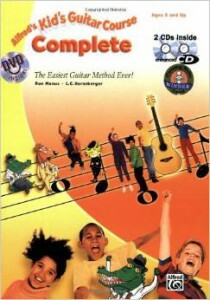 Kid’s Guitar Course 1 (Book, Enhanced CD & DVD) is a very popular guitar method book put out by Alfred Music Publishing. It was written as a method book for kids ages 5 and up. This method is great for kids because it uses simple language that kids can understand and it has a few different cartoon dogs and an alligator (who likes the blues!) It goes over how to play cords and melodies and how to read music. It also includes a CD. This course goes over all your kids need to learn about the basics of playing and will really teach your kids quite a lot. 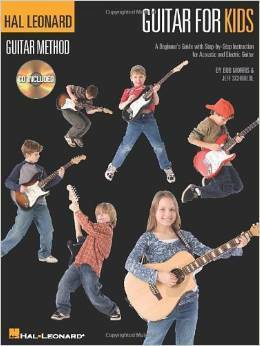 Another very popular beginner guitar book is Hal Leonard’s Guitar for Kids for Ages 5-9. It is an easy course that teaches children to play guitar quickly. It has lots of sixties songs that your kids might already know like Yellow Submarine, I’m a Believer and Hound Dog. This method is good for electric or acoustic guitars and is also okay for guitar teacher or parents, even if they’ve never had any musical training themselves. The CD that comes with it contains 30 or so tracks for demonstration and play-along. Guitar for Kids: First Steps in Learning to Play Guitar is another great book that is packed with lots of useful information that is geared towards kids. It is definitely worth checking out. If you are looking specifically for a book to help your child learn classical guitar you can try New Dimensions in Classical Guitar for Children by Sonia Michelson. This method uses concepts that are inspired by the writings of Suzuki and Kodaly.